Aside from a picture of my slipcovers on my chair, I really don't have much to show for yesterday. Believe me the slipcovers took it out of me, but that was no more exhausting that looking for stuff I'd 'cleaned up' before Christmas. And by "looking for" I mean compulsively scouring the house till I found it. PUT. AWAY. You know, WHERE IT BELONGS. Honestly people, it's amazing that I get anything done at all. So all I can do it treat you to a photo of things recently acquired. 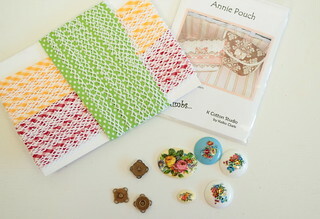 When I was at Prairie Queens in December I picked up that little Annie Pouch pattern because it was simply adorable. I think that the little bag Laura had at the class I took was made using this pattern. Keiko uses sew in magnets in the pattern, so I had to score some of those. That's those little brass bits down there. Keiko uses the bow to cover up the stitching, but I remembered the adorable little glasses case that Elizabeth made for me, and she glued one of the cabochons so I thought I'd do that too. And the fancy bias tape.. I've seen it all over those adorable children's dresses on Instagram and on Facebook. Now I have a small selection that I can play around with. Or more likely put away and NEVER FIND AGAIN. Well that's my today true confession. Hopefully I'll be getting more done. I spent at least an hour last night looking for a pattern. It's a UFO I have in my sites to finish. Where did I find it? Just were it should have been in with the pieces. Never occurred to me I had put it there. Like that cute trim, I am sure I need some of that! I am in the process of going through alllll of my sewing drawers and organizing, cutting, and trashing...not sure if it is helping or making things worse, but it has been a fun project. That bias tape looks like it might be fun to use to add a crochet edging to something. Done in by our own fits of efficiency. That's just about the way it works here too. Fortunately I don't have one of those picture perfect sewing studios--otherwise, I'd never find anything! I thought I was the only one that put things away in a "safe place" that I can't ever find again! I have to have some of that bias tape...sew cute. Sweet little too. I lose things all the time, Pam and I live in a tiny cottage (RV)so there are not many places to hide. I've never seen that fancy bias tape before!!! And what is cabochons??? Is it like ceramic buttons?